Approved Document M is a document approved and issued by the Secretary of State, with the purpose of providing practical guidance with respect to the requirements of the Building Regulations to ensure access and inclusion for all. The document outlines particular requirements and examples of solutions for some of the more common building situations. There may well be alternate ways to achieve compliance to regulations, thus there is no obligation to follow solutions contained in the document, but adoption of the guidance is the simplest way to comply. The latest version of the document was published in March 2015 and has been effective from the 1st October 2015, superseding the previous 2004 amended edition. Please note that all building work started before this date will remain applicable to the previous edition. The main change has been that the document has been split into two volumes as outlined below. The guidance provided in Volume 1 is only applicable to new dwellings and dwellings undergoing material alterations. Extensions to dwellings are not covered. It provides guidance for compliance with the requirements of M4(1), M4(2) and M4(3) of Schedule 1 of the Building Regulations. The guidance provided in Volume 2 is applicable to newly constructed non-domestic buildings, extensions or material alterations of non-domestic buildings and the change of an existing building to a hotel, boarding house, institution, public building or shop. It provides guidance for compliance with the requirements of M1, M2 and M3 of Schedule 1 of the Building Regulations, to ensure that buildings are accessible and usable by individuals regardless of their age, gender or disability. Approved Document M provides guidance on various elements of the built environment with regards to access to and use of a building. The document focuses on entrances, circulation areas, facilities and sanitary accommodation but also covers detail with respects to entrance and internal doors. 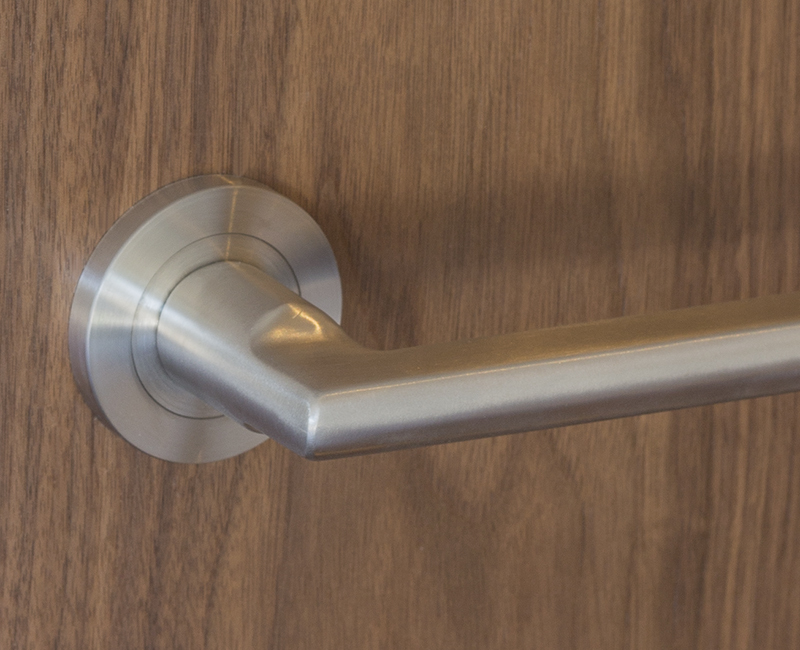 When specifying doors and the associated hardware, it is important to consider the requirements of the Approved Document M and how they apply to the door. Outlined below are the main areas detailed within the document which affect the door. The space around and through the door impacts on how users approach the door, particularly wheelchair users. The minimum effective clear opening widths stated in Approved Document M are measured from the outside of the door frame stop on the closing side of the door, to the furthest projecting obstruction on the hinge side of the door, whether that is the door itself, projecting e.g. projecting door furniture or the door stop. The range of minimum effective clear opening widths stated in Approved Document M are listed opposite. It is important that the force required to open a door is kept to a minimum, particularly where door closing devices are installed. - Less than 30N between 0 and 30 degrees. - Less than 22.5N between 30 to 60 degrees. 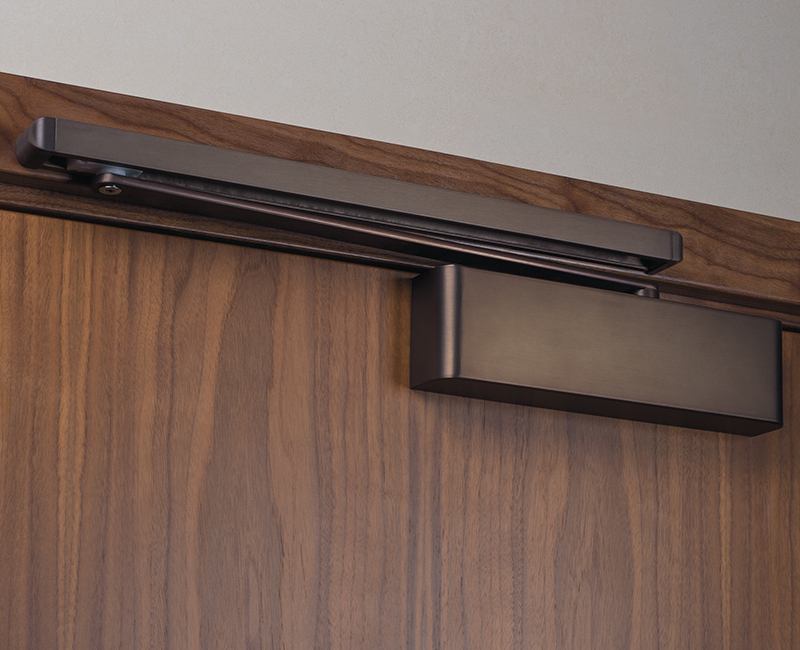 It is imperative that the door closer specified for the door is an efficient mechanism ensuring that it will close the door every time, whilst also adhering to the requirements of Approved Document M. For further assistance on door closer efficiency, please do not hesitate to contact Doorview. 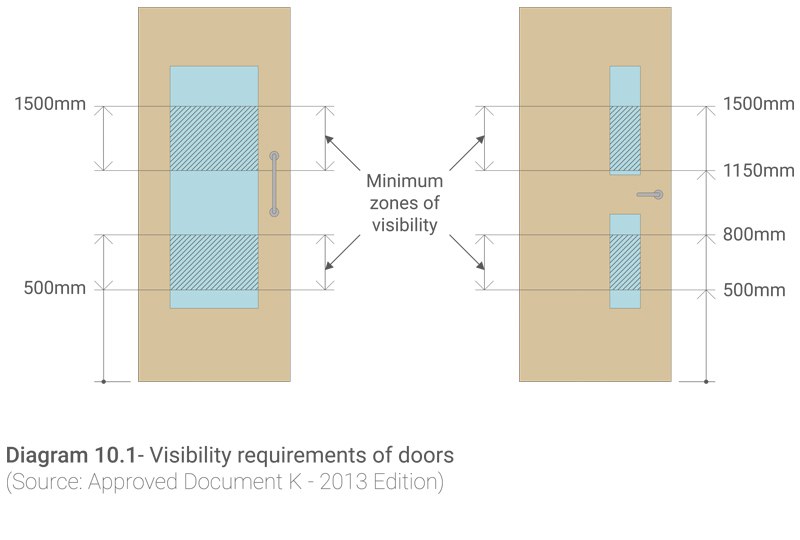 Approved Document M states that where appropriate in door leaves or side panels wider than 450mm, vision panels towards the leading edge of the door have vertical dimensions which include at least the minimum zone of visibility between 500mm and 1500mm from the floor, if necessary interrupted between 800mm and 1150mm above the floor e.g. to accommodate an intermediate horizontal rail (See Diagram 10.1 opposite). NEED ADVICE ON APPROVED DOCUMENT M? Our technical experts will be able to advise on how you can meet the requirements of Approved Document M.
Approved Document M states that all door opening furniture contrasts with the surface of the doors. In addition, the door frames should contrast visually with the surrounding wall. - Door opening furniture should contrast with the surface of the door by 15 LRV points. - The door frame should contrast with the surrounding wall by 30 points. Door view can assist you with the measurement of LRVs to ensure the reqiurements are met. Contact us for further details. Any change in surface or level, such as gradients and upstands found at door thresholds, can be problematic for wheelchairs, the visually impaired and less able. 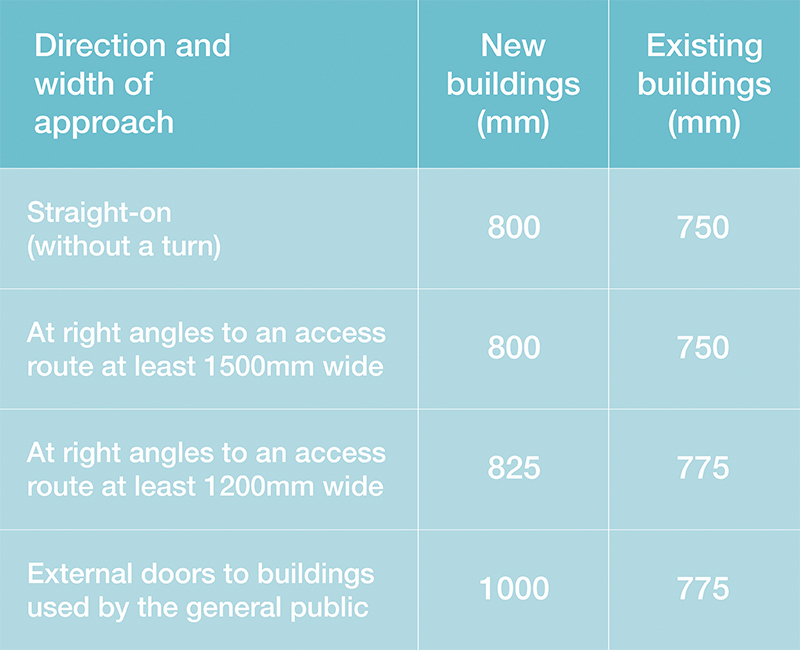 To meet the requirements set out in BS8300, thresholds should preferably be level. There are cases where a raised threshold is unavoidable, usually to to prevent water ingress. In these cases the threshold should have a maximum height of 15mm. Any upstand more than 5mm high should have exposed edges chamfered or round to minimise problems with access.